Surface water and combined sewerage systems are traditionally used to collect and transfer storm water in the UK but have several disadvantages compared to Sustainable Drainage Systems (or SuDS). These disadvantages include a limited ability to treat water quality and a lack of adaptability to change, for example, the expansion of urbanised areas and increased frequency and severity of storm events due to climate change. Consequently SuDS have many features that potentially make them attractive to developers and local authorities, and, as a result, there is now a considerable emphasis on supporting the uptake of SuDS technologies in UK policy and legislation. However, a lack of commitment to the long-term delivery of SuDS is cited as a hindrance to more wide-scale uptake, coupled with an overarching sentiment that insufficient funds and other resources have been committed to flood resilience in the UK in general. Despite this, the number of potential component options that may be included in SuDS management trains in the UK is considerable, offering the identification and implementation of suitable combinations of options for a variety of situations. 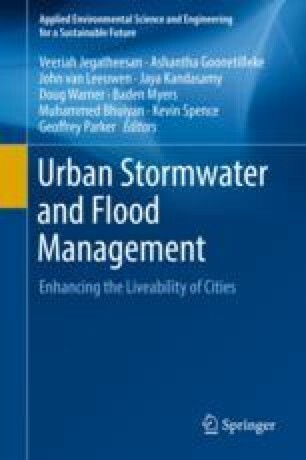 This chapter will identify and discuss these options, placing them in the context of current challenges to water supply and storm water management in the UK.